OBJECTIVE: To assess the knowledge of, demand for, and need for the orthodontic specialty in comparison to other dental fields in a sample of Saudi males. MATERIALS AND METHODS: A multiple choice questionnaire was designed to assess participants' knowledge interest, demand, and need for treatment in the following dental specialties: orthodontics, periodontics, prosthodontics, endodontics, and restorative dentistry. Subjects desiring clinical examination underwent further assessment to document their actual needs. In addition to the subjects' age, the frequencies of tooth brushing, dental pain, treatment seeking, and routine checkup were collected. Descriptive statistics and Pearson's Chi-square test were applied to compare the percentages of the knowledge of, demand for, and need for each dental discipline. The significance level was set at P < 0.05. RESULTS: A total of 1566 Saudi males completed the initial survey of dental knowledge, and 1406 subjects then completed the needs checklist. For the assessment of treatment needed, a total of 177 Saudi males were examined. The average age was 31.25 years (±13.44) and 30.61 years (±10.21) for the surveyed and examined groups, respectively. Subjects' interest in orthodontic knowledge (25%) and demand (27.6%) were not significantly different (P = 0.113), unlike the highly significant difference in the need counterpart (62.5%, P < 0.001). Highly significant differences (P < 0.001) were detected between the three outcome frequencies (knowledge interest, demand, and need) within all dental disciplines, except for the endodontic group where there was no significant difference detected (P = 0.625). Further analysis for the differences between each possible pairing of the three outcomes is highlighted. CONCLUSIONS: Subjects' knowledge of orthodontics approximated their treatment demand. However, orthodontic need was significantly much higher. Different patterns of distinction for other dental specialties were detected and described. Patients' dental knowledge about the prevention of tooth decay was found to be an important factor in determining strategies for dental care and education programs in individual dental offices. One study attempted to describe the level of general public knowledge about oral disease and its prevention; approximately 60% of the studied sample was able to identify the signs of inflamed gingiva and the preventative role of fluoridated water. A sample of Kuwaiti University students demonstrated a lack of knowledge about dental caries and periodontal diseases, whereas 29.5% of the sample were not able to recognize any measures to prevent gums from bleeding. Socioeconomic and educational factors also influence these aspects of their knowledge, as schoolteachers were shown to have more accurate knowledge about the causes and prevention of dental caries and periodontal disease than that of students and their parents. Awareness of one's own malocclusion can be a step toward seeking proper treatment. An earlier study indicated a high dental awareness level in young adults regarding their preexisting malocclusion status. This self-perception is influenced by constant ridicule from others and was shown to drive the seeking of orthodontic therapy. The demand for orthodontic treatment among adolescents can reach up to 60% in the general population. This increase in demand has indeed matched an increase in patients' reported awareness. Likewise, the need for prosthodontic services has been well established in recent years, especially with the introduction of highly esthetic ceramic and porcelain treatment modalities. However, one study showed a lack of awareness of common prosthodontic problems, the number of visits required for treatment completion, and the materials used to construct a prosthetic restoration. It was concluded that dentists must explain all aspects of a proposed prosthodontic treatment and its duration requirements. The literature reports a lack of public knowledge about endodontic treatment. In a self-completed questionnaire distributed at a dental school in Turkey, 15% of the patients were in favor of affected tooth extraction as opposed to endodontic treatment; this percentage dropped to 2.5% post endodontic treatment. 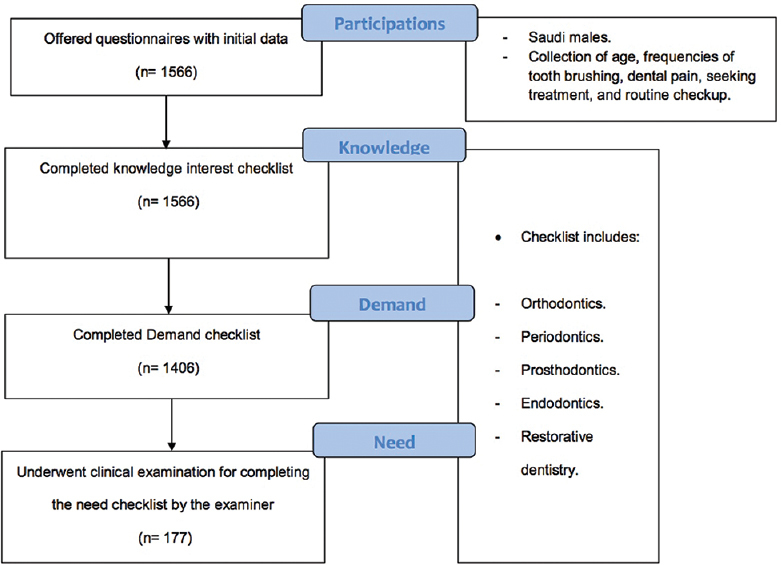 Because the literature lacks data on population-based knowledge of dental therapies, with an associated demand/needs analysis for each dental discipline, the aim of the study was to quantify values, compared to other dental fields, for orthodontic knowledge interest, demand, and need in a sample of Saudi males. The secondary aim was to further investigate any relationship between the three variables and to highlight additional confounding behavioral characteristics of the study participants pertaining to oral hygiene measures. This cross-sectional study was completed utilizing three forms originally designed for the present study. The first multiple choice questionnaire was distributed listing various dental specialties (orthodontics, periodontics, prosthodontics, endodontics, and restorative dentistry). Participants were asked to tick the specialty in which they felt they were interested in acquiring knowledge. Each subject was then asked if he/she was in need of further dental treatment. Another list of the same dental specialties was then introduced to select the needed dental services from the subject's own perspective. The two listing forms (representing the knowledge and demand domains) were distributed randomly to male subjects on major sidewalks, and within King Saud Main Campus Hall, Riyadh, Saudi Arabia. To investigate the actual need for dental treatment, a mobile dental unit was set up at the same locations, and dental screening was completed for subjects desiring clinical examination and proper assessment of their needs. A third specialty listing was used to tick the required dental treatment for each subject from the clinician's perspective. For the purpose of proper comparison, the listing was composed of the same specialties, namely, orthodontics, periodontics, prosthodontics, endodontics, and restorative dentistry. All clinical assessments were performed by five dental interns. Subjects were considered to be in need of each dental service based on the presence of at least one clinical dental sign pertaining to that specialty domain. In addition to subjects' age, the frequencies of tooth brushing, dental pain, treatment seeking, and routine checkup were collected to assess the sample behavioral pattern regarding the maintenance of good oral hygiene. [Figure 1] shows a consort diagram highlighting the study design and the investigated variables. The study protocol was reviewed and approved by the College of Dentistry Research Center at King Saud University. All data were combined and analyzed using SPSS statistical package 22 (Armonk, NY). Descriptive statistics and then Pearson's Chi-square test were applied to compare the percentage of the knowledge, demand, and need findings for each dental discipline. A total of 1566 Saudi males completed the initial survey of dental knowledge. From that group, 1406 subjects (89.78%) then completed the treatment needs checklist. The average age was 31.25 years (±13.44), ranging from 16 to 80 years. Regarding the treatment needs data collection, 177 Saudi male subjects were examined, and the average age was 30.61 years (±10.21), ranging from 17 to 65 years. A total of 71% of subjects brushed their teeth on a daily basis, and almost half (51%) reported experiencing dental pain during the last month, of which only 38% had sought an appointment to manage it. Finally, 24% of the subjects studied reported visiting their dentist regularly, without the presence of dental pain, for dental checkup and scaling. When participants were asked about the frequency of their dental visits during the past year, 39.9% reported no visit. The majority of visits reported were once (27.7%), followed by three or more times (17.1%), and twice a year (15.4%). [Figure 2] and [Table 1] illustrate the percentage of knowledge interest, demand, and need for each specialty group. The proportions of the three outcomes (namely knowledge interest, demand, and need) for each specialty group were then compared. Highly significant differences were detected with Pearson Chi-square test using two degrees of freedom between all three outcomes for all specialties (P< 0.001), except for the endodontic group where there was no significant difference detected (P = 0.625). Further comparison was completed between each possible pairing of the three outcomes for each specialty. [Table 2] shows the P values for these investigations using Chi-square test. When the three outcomes of each specialty were analyzed with each other for any significant correlations using Spearman test, significant correlations could be found. The study reported a relatively good level of oral hygiene practice, which was measured in the study sample as 71% of subjects who brushed their teeth daily. The Saudi health information survey detected similar findings, as 71.5% of subjects reported brushing their teeth once daily. The survey also illustrated the approximate frequency range (to current findings) of visiting the dentist due to pain and attending routine checkup with no pain at 48.6 and 11.5%, respectively. A prior study on Saudis related this below-optimal brushing frequency and checkup habits to the fact that oral hygiene habits are taught relatively late in life and that oral health awareness was rather low as a result of such introductory delay. A quarter of the participants showed interest in building additional knowledge about orthodontics. A similar but not significant proportion demanded orthodontic therapy (27.6%). Both proportions were significantly different than the increased need reported at 62.5%. This result was in agreement with the reported high need for orthodontic treatment reaching 77% of patients attending King Saud University dental clinics. The present study did not detect any significant correlations between orthodontic demand and need. Another study using a different set of assessments did not detect such a relationship either. Sam et al. were able to locate such a relationship in only selected demand and need subgroups of a Saudi sample and not an overall demand domain. Another study in the western Saudi Arabia region concluded that patient's perceptions of orthodontic treatment did not always correlate with professional assessment, by means of using an index of treatment needs. The international communities' findings are in agreement with the reported lack of correlation between orthodontic knowledge and demand. A study that interviewed patients and their parents concerning treatment need and knowledge about orthodontic treatment showed no significant differences between their judgment of dental assessment and treatment need. Similar findings were found for the lack of association between orthodontic treatment need and demand. Compared to actual need, the lower orthodontic and periodontic treatment demand can be attributed to the level of low interest in knowledge (awareness) indicated in the study. Awareness of the need for the right actions by patients, through proper dental treatment-seeking, was considered a key factor toward improving periodontal health. [Table 2] shows no significant differences between demand and need for prosthodontic care. The literature shows the location of missing teeth as an indicator of treatment need, deriving the highest demand for fixed prosthesis on unilateral distal end cases (Kennedy Class II). Another reason for the lack of distinction between prosthodontic need and demand is the difficulty measuring a highly individualized preference, which is usually based on a patient's own opinion. The literature lacks an investigation of the knowledge, need, and demand for endodontic treatment. As a response to aid in patient education, some methods of knowledge transfer were discussed, including a 5-min audio–visual film. The reported endodontic need for the current Saudi sample was 14.8%. The prevalence of apical periodontitis reported for Saudis ranged from 53.5 to 63.9%. An earlier study calculated the average root canal treatment per subject at 1.64. Internationally, the prevalence varied from 7 to 86%. A contributing cause of the relatively low prevalence in this study can be referred to not including radiographic analysis of the screening process. The restorative scoring among the three study outcomes displayed the most discrepancies, with significant differences between each one of the pairs. The increased prevalence of caries in Saudi Arabia is well established in the literature with a high value (78.9%) and a mean teeth decay component index of 2.68 (±2.21). A total of 46.8% of participants demanded restorative treatment in the current study; this result was similar to other study findings showing a demand of 40% of participants. The large gap between the restorative demand and need was also found to be significantly different in another study. In the literature, unmet need for dental care was previously attributed to the cost of treatment. The present study displayed variable findings for each discipline. Similarly, subjective perceptions of esthetic and functional treatment needs were found to be highly variable among the Saudi male patients. A potential reason for the inconsistency with some literature findings can be attributed to the direct way in which questions were asked (i.e., direct listing). The sensitivity and specificity values of the demand survey questions were reported to be variable due to imprecise wording. Limitations of the study include not utilizing radiographic assessment for detecting the actual restorative and endodontic needs, along with the lack of examiner calibration. However, following a common clinical practice based on basic dental guidelines enabled the capture of extended data on different disciplines that benefited the drafting of the initial findings, which would drive conducting extended controlled research in specialty areas of interest and for both genders. Given the current study findings, emphasis must be made on the dentist's role as the main source of dental health information, where an adequate dental information presentation would contribute to improving patients' overall correct knowledge. As explained earlier, the dental profession should be prepared to provide increased amounts of diagnostic, preventive, fixed prosthodontic, endodontic, and orthodontic services. On the contrary, school-based oral health promotion programs should be established to influence the oral health behavior of children and their parents. Subjects' knowledge on orthodontics approximated their demand. However, orthodontic need was significantly much higher. Different distinct patterns for other dental specialties were detected and described. The author would like to acknowledge Dr. Sara AlHalees for her kind contribution to the review process. Fan-Hsu JC, Handelman SL. Patients' knowledge of caries prevention. A study. N Y State Dent J 1989;55:28-30. Gift HC, Corbin SB, Nowjack-Raymer RE. Public knowledge of prevention of dental disease. Public Health Rep 1994;109:397-404. Al-Hussaini R, Al-Kandari M, Hamadi T, Al-Mutawa A, Honkala S, Memon A. Dental health knowledge, attitudes and behaviour among students at the Kuwait University Health Sciences Centre. Med Princ Pract 2003;12:260-5. Petersen PE, Hadi R, Al-Zaabi FS, Hussein JM, Behbehani JM, Skougaard MR, et al. Dental knowledge, attitudes and behavior among Kuwaiti mothers and school teachers. J Pedod 1990;14:158-64. Marques LS, Filogonio CA, Filogonio CB, Pereira LJ, Pordeus IA, Paiva SM, et al. Aesthetic impact of malocclusion in the daily living of Brazilian adolescents. J Orthod 2009;36:152-9. Kelly JR, Nishimura I, Campbell SD. Ceramics in dentistry: Historical roots and current perspectives. J Prosthet Dent 1996;75:18-32. Zhai JJ, Liang X, Ding H, Zhang Q, Li T. [The investigation patients' general knowledge about artificial teeth prosthetics]. Hua Xi Kou Qiang Yi Xue Za Zhi 2009;27:53-7. Gorduysus MO, Gorduysus MG. Endodontic patient profile of Hacettepe University, Faculty of Dentistry in Ankara, Turkey. Int Dent J 2000;50:274-8. Alamoudi N, Salako NO, Massoud I. Caries experience of children aged 6-9 years in Jeddah, Saudi Arabia. Int J Paediatr Dent 1996;6:101-5. Wyne AH, Al-Ghorabi BM, Al-Asiri YA, Khan NB. Caries prevalence in Saudi primary schoolchildren of Riyadh and their teachers' oral health knowledge, attitude and practices. Saudi Med J 2002;23:77-81. El-Angbawi MF, Younes SA. Periodontal disease prevalence and dental needs among schoolchildren in Saudi Arabia. Community Dent Oral Epidemiol 1982;10:98-9. El Bcheraoui C, Tuffaha M, Daoud F, Kravitz H, AlMazroa MA, Al Saeedi M, et al. Use of dental clinics and oral hygiene practices in the Kingdom of Saudi Arabia, 2013. Int Dent J 2016;66:99-104. Al-Otaibi M, Angmar-Mansson B. Oral hygiene habits and oral health awareness among urban Saudi Arabians. Oral Health Prev Dent 2004;2:389-96. Al-Jobair AM, Baidas LF, Al-Hamid AA, Al-Qahtani SG, Al-Najjar AT, Al-Kawari HM. Orthodontic treatment need among young Saudis attending public versus private dental practices in Riyadh. Clin Cosmet Investig Dent 2016;8:121-9. Sam G, Seehan S, Al-Shayea M. An Analysis of Correlation between Demand and Need for Orthodontic Treatment among Patients in Prince Sattam Bin Abdulaziz University Dental College Clinic, Kingdom of Saudi Arabia. J Int Oral Health 2015;7(Suppl 2):40-4. Tulloch JF, Shaw WC, Underhill C, Smith A, Jones G, Jones M. A comparison of attitudes toward orthodontic treatment in British and American communities. Am J Orthod 1984;85:253-9. Zreaqat M, Hassan R, Ismail AR, Ismail NM, Aziz FA. Orthodontic treatment need and demand among 12- and 16 year-old school children in Malaysia. Oral Health Dent Manag 2013;12:217-21. Croxson LJ. Periodontal awareness: The key to periodontal health. Int Dent J 1993;43(2 Suppl 1):167-77. Jayasinghe RM, Perera J, Jayasinghe V, Thilakumara IP, Rasnayaka S, Shiraz MHM, et al. Awareness, attitudes, need and demand on replacement of missing teeth among a group of partially dentate patients attending a University Dental Hospital. BMC Res Notes 2017;10:334. Narby B, Kronstrom M, Soderfeldt B, Palmqvist S. Prosthodontics and the patient: what is oral rehabilitation need? 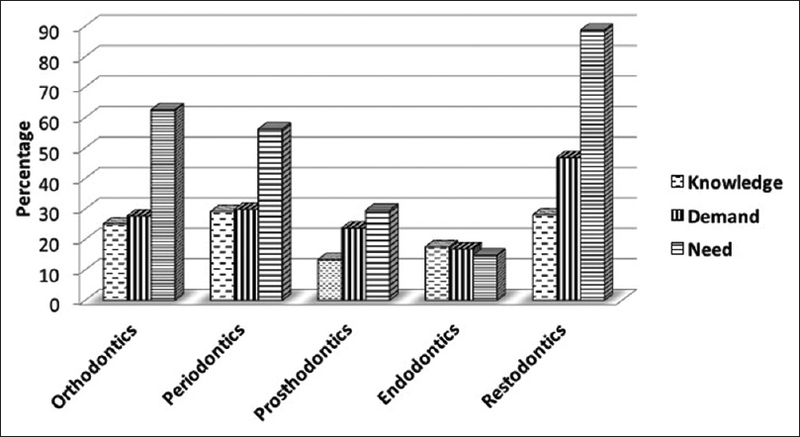 Conceptual analysis of need and demand for prosthodontic treatment. Part 1: A conceptual analysis. Int J Prosthodont 2005;18:75-9. Sorrell JT, McNeil DW, Gochenour LL, Jackson CR. Evidence-based patient education: Knowledge transfer to endodontic patients. J Dent Educ 2009;73:1293-305. Alrahabi M, Younes HB. A cross-sectional study of the quality of root canal treatment in Al-Madinah Al-Munawwarah. Saudi Endod J 2016;6:31-5. Al-Nazhan SA, Alsaeed SA, Al-Attas HA, Dohaithem AJ, Al-Serhan MS, Al-Maflehi NS. Prevalence of apical periodontitis and quality of root canal treatment in an adult Saudi population. Saudi Med J 2017;38:413-21. Alfouzan K, Baskaradoss JK, Geevarghese A, Alzahrani M, Alhezaimi K. Radiographic Diagnosis of Periapical Status and Quality of Root Canal Fillings in a Saudi Arabian Subpopulation. Oral Health Prev Dent 2016;14:241-8. Persoon IF, Ozok AR. Definitions and Epidemiology of Endodontic Infections. Curr Oral Health Rep 2017;4:278-85. Aljanakh M. Prevalence and severity of dental caries among public school students aged 16-l8 in Hai'l, Kingdom of Saudi Arabia. Int J Health Sci (Qassim) 2017;11:50-3. Pradeep Y, Chakravarty KK, Simhadri K, Ghenam A, Naidu GM, Vundavalli S. Gaps in need, demand, and effective demand for dental care utilization among residents of Krishna district, Andhra Pradesh, India. J Int Soc Prev Community Dent 2016;6(Suppl 2):S116-21. Wanman A, Wigren L. Need and demand for dental treatment. A comparison between an evaluation based on an epidemiologic study of 35-, 50-, and 65-year-olds and performed dental treatment of matched age groups. Acta Odontol Scand 1995;53:318-24. Malecki K, Wisk LE, Walsh M, McWilliams C, Eggers S, Olson M. Oral health equity and unmet dental care needs in a population-based sample: Findings from the Survey of the Health of Wisconsin. Am J Public Health 2015;105(Suppl 3):S466-74. Rise J. Validation of data on demand and need for dental treatment in an elderly population. Community Dent Oral Epidemiol 1979;7:1-5. Mafeni JO, Messer LB. Parental knowledge and attitudes towards pit and fissure sealants. Aust Dent J 1994;39:172-80. Douglass CW, Furino A. Balancing dental service requirements and supplies: Epidemiologic and demographic evidence. J Am Dent Assoc 1990;121:587-92. Rajab LD, Petersen PE, Bakaeen G, Hamdan MA. Oral health behaviour of schoolchildren and parents in Jordan. Int J Paediatr Dent 2002;12:168-76.